The TC670 is an integrated fan speed sensor that predicts and/or detects fan failure, preventing thermal damage to systems with cooling fans. When the fan speed falls below a user specified level, the TC670 asserts an ALERT signal. With this design, a critical minimum fan speed is determined by the user. The fan alert level is then set with a resistor divider on the THRESHOLD pin of the TC670. When the minimum fan speed is reached, the ALERT pin changes from a digital HIGH to LOW. This failure detection works with all linear controlled 2-wire fans. The TC670 eliminates the need for 3-wire fan solutions. A CLEAR option can be used to reset the ALERT signal, allowing the flexibility of connecting the ALERT output of the TC670 with other Alert/Fault interrupts in the system. This feature can be implemented so that false fan fault conditions do not initiate system shutdown. The TC670 is specified to operate over the full industrial temperature range of -40°C to 85°C. The TC670 is offered in a SOT23-6 pin package and consumes 90uA (typ) during operation. The space saving package and low power consumption make this device an ideal choice for systems requiring fan speed monitoring. The TC670 is an integrated fan speed sensor that predicts and/or detects fan failure, preventing thermal damage to systems with cooling fans. When the fan speed falls below a user specified level, the TC670 asserts an ALERT signal. 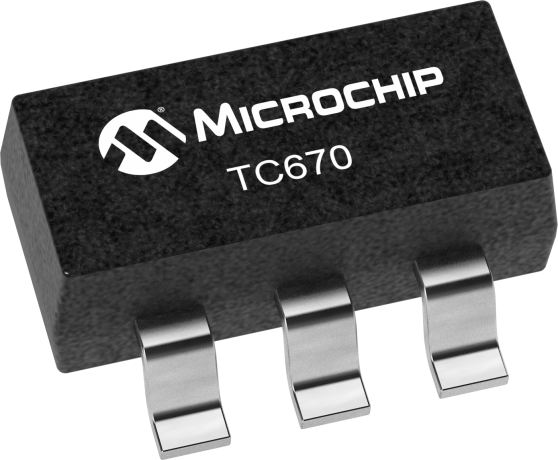 The TC670 is a predictive fan failure detector that asserts a signal whenever the fan's RPM falls below a user-programmable RPM level.